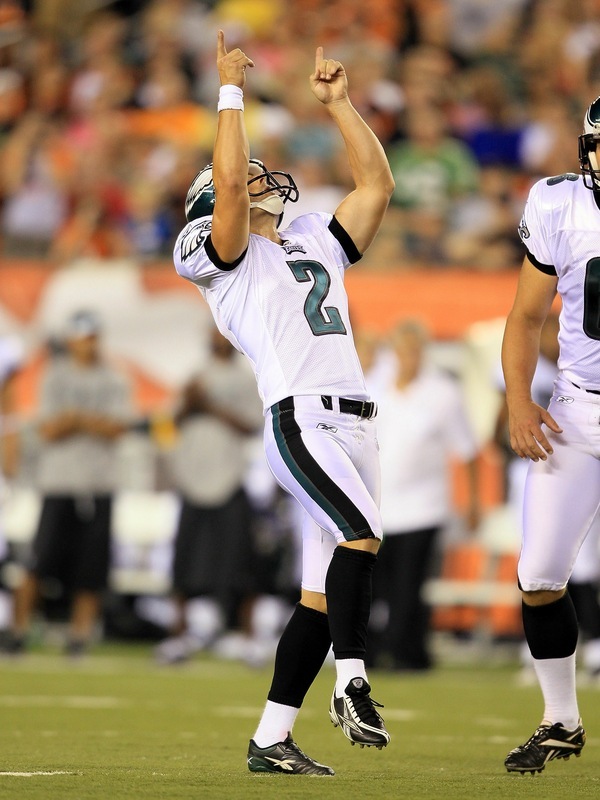 On Friday night, the Eagles offensive starters played the first two quarters against the Cincinnati Bengals. Unfortunately, in those two quarters, the offense could only mustarded up a whopping six points and had numerous three-and-outs. Besides struggling to score, the offense was sluggish all around. WR Jeremy Maclin fumbled a ball deep in Bengals territory, which would have kept a drive alive or at least led to a David Akers field goal attempt. Maclin was not the only player on the field that was uninspiring. 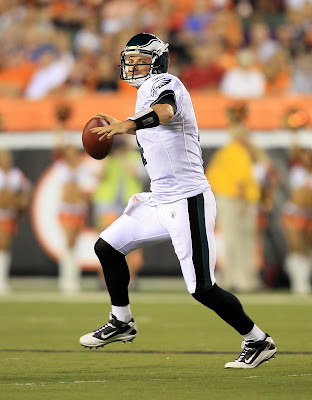 Quarterback Kevin Kolb missed an open Jason Avant over the middle of the field for a sure touchdown as the first half was winding down. Additionally, the offensive line was called for three illegal formation penalties and one took away a red zone touchdown (would have been the first for the starting offense in three quarters of football). "It happened to us last week. We can't have that,” said Kolb about the penalties stalling drives. “It's the same story. We have to get it taken care of. It's going to hinder us down the line if we don't get it taken care of. It's on us -- not them." Not only did the offensive line draw yellow flags, they allowed way too much pressure up the middle, which forced Kolb to throw on the run or off his back foot. The coaches certainly did not like seeing their talented quarterback getting drilled on a constant basis, but Kolb did not seem to mind getting hit or even dealing with the pressure by brought by the Bengals front seven. Ultimately, all these problems took its toll on the Eagles, as they failed to sustain a drive until the second quarter. Even when they did manage to move the ball, their drives stalled inside the 30 for one reason or another. "We were a little stagnant on the first three drives there," said Kevin Kolb about the first half performance of his offense. "We needed to pick the energy level up. We did it and we were better in the second quarter. We got our running game going a little bit and got a couple drives. Again, we just have to execute in the red zone. I missed a throw there in the end zone and we also had that penalty that cost us. I think we did some good things; it was a positive day, but we have to start fine-tuning those details." In tomorrow’s box score Kolb's numbers look impressive, 11-for-17 for 126, but it took the Eagles offense a whole quarter to pick up a mere first down. Nonetheless, Kolb feels there are multiple explanations for the team coming out flat. One reason is the Bengals having a very good defense and the other lies on the players. "First of all they have a good defense," Kolb said. “Our running game needs to get going a little bit earlier. We need to get into a better rhythm, I think. We just went three and out. We need to get a couple first downs and get into that rhythm. I think that's what I think will kick-start an offense a lot of times. If we had gotten a couple of five or six play drives, it would help us. We finally did it and we were able to move the ball and got into the red zone and should have had some scores there." Last week, the Eagles first-string offense was effective and efficient (except in the red zone) in their only two possessions; both ended in points. This week they appeared anemic, but Kolb sounded like a true veteran leader as explained that their downfalls and inefficiencies against the Bengals were a vital learning experience. "Yeah, and you're going to have games like this. Cincinnati has a lot of games like this, where it is a grind," Kolb said. "We've seen it when the weather gets cold that you have to be able to grind the ball and get your points when you're down there. It's a good learning experience. It's not always going to be 45 points on the board and 500 yards. We can learn from it, we can move on, and that's why we're in the preseason." Even with the offenses woes and mediocre performance, Kolb still likes that the Eagles are seeing a lot of different formations from defenses in the preseason. He believes seeing the multiple looks first-hand will only benefit the Eagles during the regular season and in their week one game against the Green Bay Packers at Lincoln Financial Field. "What I like is that we're getting a lot of different looks. We are seeing a lot of different things, so we're learning every single day," he said. "We're learning every game. "That's what you want right now, especially with a young group, including myself. We want to learn every time we're on the field. We learned a lot today and we can get better from it and it'll help us during the season." While most fans perceive tonight's performance as lackluster or a clunker, Kolb sees it very differently. Kolb thinks the Eagles accomplished a goal, which the team was not able to do last week. "I think the biggest thing is getting a feel for a game-type atmosphere. Preparing like a game and learning from situations," said Kolb about achieving something tonight that they were unable to do last week versus Jacksonville. "We had a couple three-and-outs, let's rally the guys and get it going. "That's what a game is all about. We felt that today. We all rallied up, got each other up, called up a meeting, got it together and put a few drives together. That's what you want to see and that's what you want to feel and we did that today." All in all, it was a miserable night for the offensive line (particularly the interior line and Peters). In addition Kolb showed poor execution as he missed a couple of throws, as the field and throwing windows got smaller. Furthermore, the running game is still not on track. For Eagles fans, it would seem like there are more reasons for concerned about the offense coming out of this game than being happy with their play. Nevertheless, the important statistic and the most overlooked stat of the night is that the Eagles were able to stay close against one of the best teams in the league with a porous offensive performance. When the starters were pulled at halftime, the Eagles trailed by only a single point with an offense that stalled for an entire quarter. Once the Eagles get C Jamaal Jackson and G Todd Herremans back on the field, the story might be entirely different. Should there be unease with the offense struggling against the Bengals? Yes, there definitely should be some. However for an extremely young team, on the road, not playing their best game and missing two significant starters along the offensive line it is quite a feat to stay close to a team that might be playing for the Lombardi Trophy come February.